Independence day is only 2 days away but we’ve been celebrating all weekend long. In fact, in our beach town, the big fireworks show was Saturday evening, June 30th? 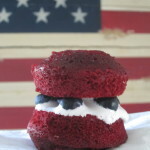 We’re fine taking every opportunity possible to get festive and go red, white, and blue. 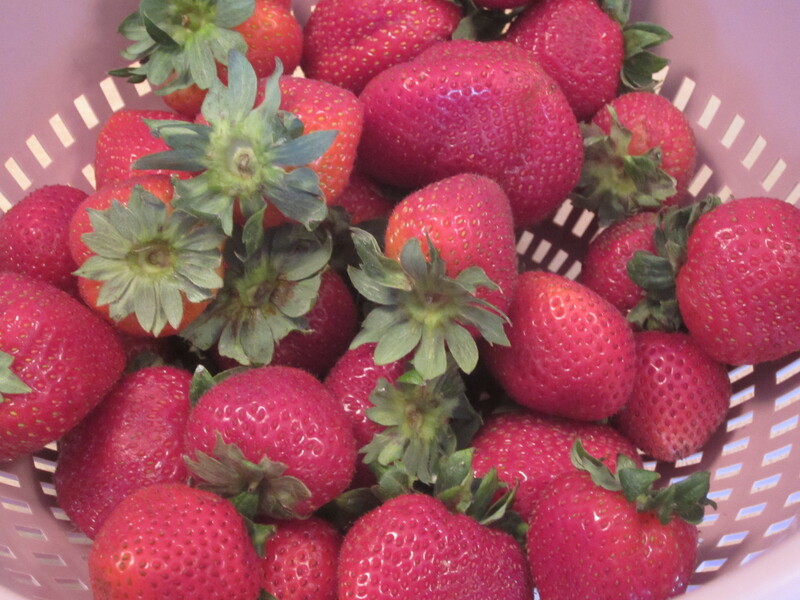 Lucky for us, I had a ton of freshly-picked strawberries from the local farmer’s market. 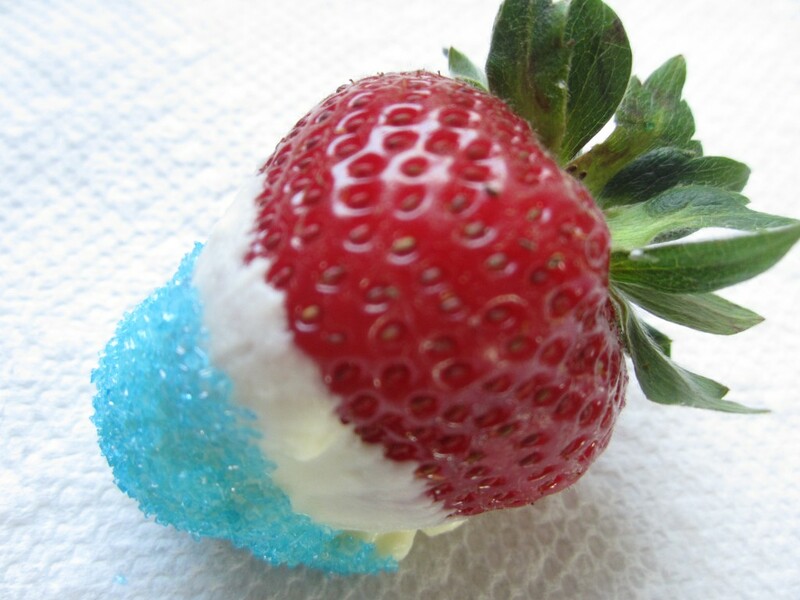 So, all I needed to do was figure out something white and blue that would not only look good but, taste good with strawberries. I also wanted a treat that didn’t require any baking, that could be assembled by my 7-year old son and his 4-year old cousin without too much guidance. I discovered I had white chocolate morsels and blue sanding sugar in my pantry—the perfect patriotic coating for the strawberries. We set up the kitchen table like an assembly line starting with the strawberries. We gently grabbed the strawberries by the stems, and very delicately dipped them in a bowl of melted white chocolate morsels. (It took three different attempts to melt the morsels to peak perfection. I’d suggest microwaving them at 45 second intervals, stirring in between until fully melted). We definitely drowned about 1/3 of the strawberries in the chocolate due to stem breakage. Be very careful when dipping them in the chocolate. It’s better to hold onto the sides of the strawberries to reach the desired amount of white chocolate coating. We then ever-so-slowly dipped just the tip of the white chocolate-covered strawberries into the blue sanding sugar and set them down on a parchment-lined baking sheet. When full, we placed the sheet in the refrigerater for the chocolate/sugar shell to harden. 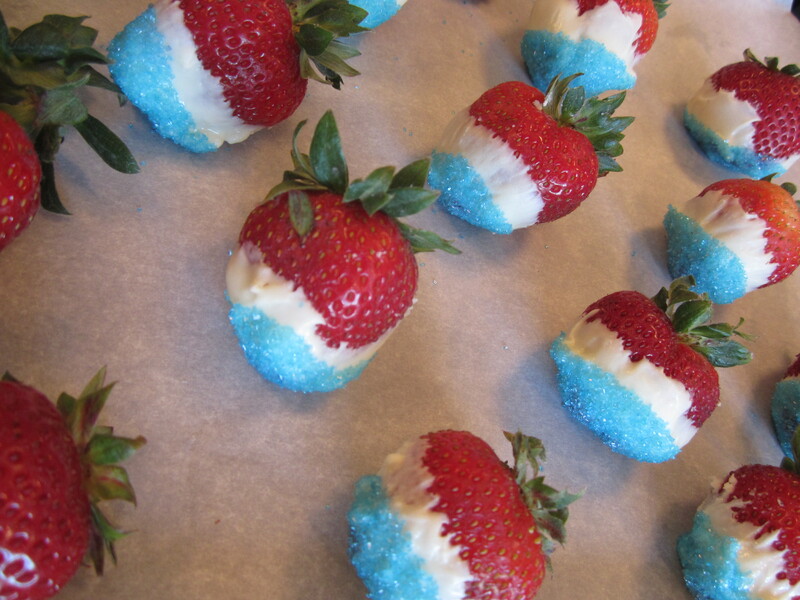 Twenty minutes later we served beautiful, chilled Patriotic Strawberries to the family! 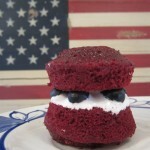 It’s a good thing we can make them a few more times until July 4th! Clean strawberries and pat dry. Line cookie sheet or plate with parchment paper or fol. 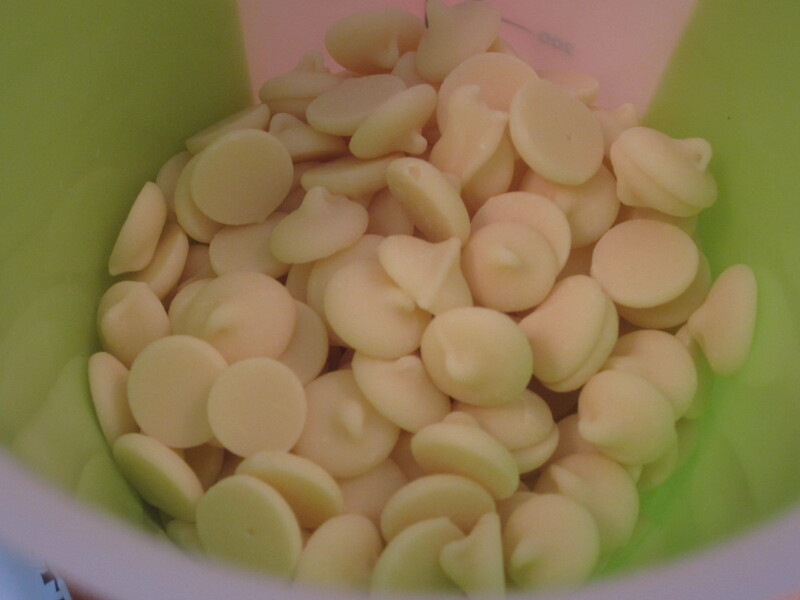 Place white chocolate in microwave-safe bowl and heat in 45 second intervals, until smooth. 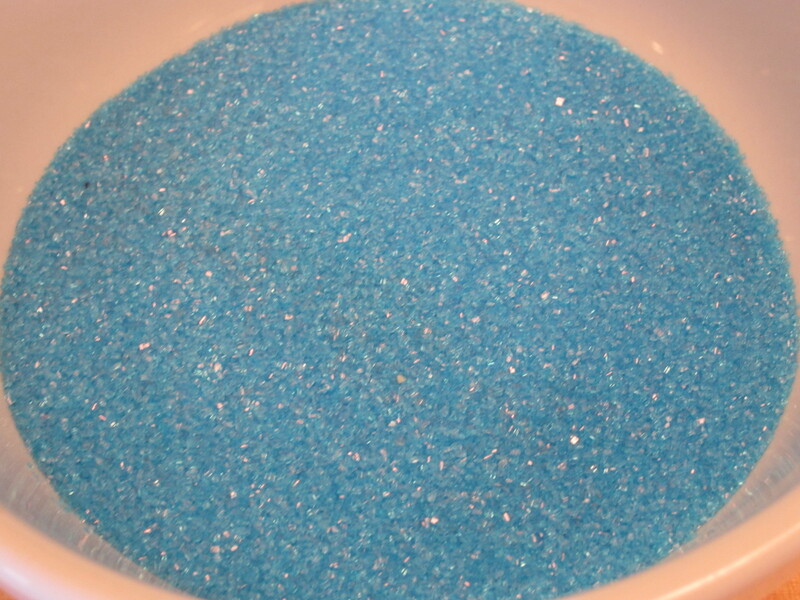 Place sugar in small bowl. Hold the strawberries by the stem and dip berry into chocolate until 2/3 covered. Then dip bottom third of strawberry into the blue sugar or sprinkles. When finished, chill of at least 20 minutes. One (1) winner will receive a Koolatron 14-Quart Soft-Sided Electric Travel Cooler! To enter to win, simply leave a comment in the post letting telling me what foods you’d pack in your new cooler. That’s it, you’re entered to win. Deadline: Monday July 2, 2012 at 11:59pm EST.